The NCT series of tables expand Machining Centers production capacity. 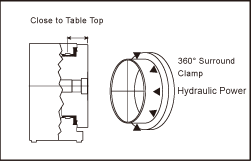 Mounted in either a horizontal or vertical plane, these tables are used to add 4th or 5th axis capability. Inside the rotary tables, the worm shaft and worm gear system decide the tables' accuracy and life. Through the strict inspection and in-house machining of the worm system, Exact guarantees products optimal performance and high dynamic durability. 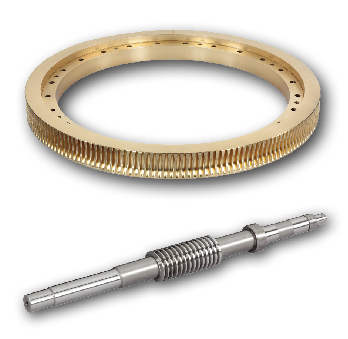 Worm gear: Special high-tensile aluminum-brass equal in strength to a steel alloy. creates a large engagement area and less pressure on the contact surface, resulting in resistance against wear. A solid and sealed clamping structure maintains maximum holding power while keeping contaminates out. Only a small amount of hydraulic fluid is required to achieve an optimum clamping force, the source of which can be from a mini hydraulic pump unit or an air-over-oil intensifier; both are options.